In Australia, and far North Queensland, we are fortunate that we mostly have ready access to an abundance of water. And some of us are more fortunate; we have a variety of water sources to choose from. So, which is the best water source for lawns? Natural rainfall – absolutely perfect for lawns; free, often abundant but unpredictable, to say the least. 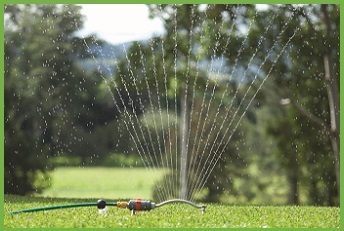 Domestic water supply – perfect for lawns but should be used wisely or you’ll end up with one shocker of a water bill. Water tank water – again, great water source for lawns but is restricted in the holding capacity and unpredictable rainfall. Grey water – good for lawns – just make sure that your home is using detergents that are low in sodium and phosphorous. Deep bore water – confined aquifer – great for lawns but you will need to analyse the water for mineral and salt content. Shallow bore water – unconfined aquifer – good for lawns but you will need to analyse the water for its salt content, as well as E.coli, fluoride, nitrate and arsenic levels. Recycled water – great for lawns where it is available. Dam water – good for lawns but you might need to consider a filter in the pump if suspended solids can be found. Natural spring water – typically an excellent water source for lawns, you will need to check the mineral and salt content. River or stream water – good for lawns but keep an eye on the salt content in the water. Regardless of the water source you have access to for your lawn, or the source you choose to use; all lawns should be watered deeply but infrequently. Aim for the entire area of your lawn receiving no more than 2.5cms of water per week. For more help with lawn care issues or to install a lawn variety best suited to handle our tropical climate just contact the team at Harden Park Lawns today. Our turf is grown locally and the varieties are specifically chosen to suit our location and climate.